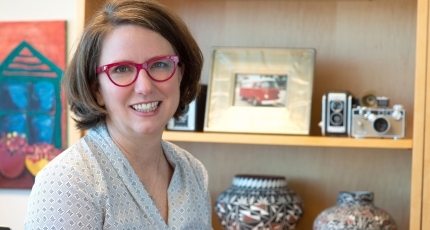 Deana Bennett’s practice is focused on natural resource development on public and tribal lands. Deana’s experience includes permitting and environmental compliance efforts under the National Environmental Policy Act (NEPA), the Endangered Species Act (ESA), the Clean Air Act (CAA), and other related federal statutes. She has worked on a number of utility matters, and her experience includes working with renewable resource developers with siting issues on public, tribal, state, and local land. Her work also includes representing wind and solar projects, focusing on state and federal environmental law, permitting, due diligence, and opinion letters. Deana has represented lenders and borrowers in a number of renewable energy projects in New Mexico. Prior to joining Modrall Sperling, Deana served as a judicial law clerk for the Honorable Richard Bosson of the New Mexico Supreme Court. 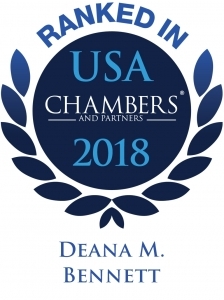 Deana was recognized as “Up and Coming” in Nationwide Native American Law by Chambers USA in 2017, and in New Mexico Native American Law in 2018. She is also recognized by Southwest Super Lawyers® as a Southwest Rising Star. It is not surprising that Deana’s practice areas focus primarily on natural resource development and public lands. Deana calls the West home, from New Mexico to Alaska. Deana’s early childhood was spent travelling in a Volkswagen bus from Yellowstone National Park to Everglades National Park, where her father was a Park Ranger. After leaving the Park Service, her father worked for the Bureau of Land Management until he retired. Deana is a true coal miner’s daughter; her mother worked in an underground coal mine in Wyoming for several years, while her father attended the University of Wyoming. Before attending law school, Deana retraced some of her childhood adventures. Deana worked in Yellowstone National Park, spent a winter working at a ski area in Utah, and spent two summers working on a luxury passenger train in Alaska, where she bought her own 1979 Volkswagen bus. Deana has driven the ALCAN twice in her bus. Deana earned her Juris Doctor from the University of New Mexico. Deana also has a M.A. in French Literature and a B.A. in French Language, both from the University of New Mexico. While studying abroad as an undergraduate, Deana travelled to Romania immediately after the revolution that marked the end of the Communist regime of Nicolae Ceausescu to deliver much-needed food, supplies, and medicine to families, churches, and communities. Involved in defending challenges to Bureau of Indian Affairs approved rights-of-way across allotted lands, including successful appeal of a right-of-way denial before the Interior Board of Indian Appeals. Representing clients in actions involving condemnations of rights-of-way across allotted lands under federal law. Participated as part of a multi-disciplinary counsel team in completing a series of interrelated transactions between BHP Billiton New Mexico Coal, Inc. (BBNMC) and its subsidiaries and the Westmoreland Coal Company, which involved, among other things, lengthy due diligence efforts to ensure proper permit transfers or approvals to the new owner, Westmoreland Coal Company. Participated as part of a multi-disciplinary counsel team in completing a series of interrelated transactions between BBNMC and its subsidiaries and the Navajo Nation and Navajo Transitional Energy Company, LLC (NTEC), a wholly owned enterprise of the Navajo Nation. The successful closing followed execution of lengthy due diligence efforts, the crafting of several agreements and related documents, and the navigation of Navajo Nation legislative and executive approval processes to ensure the enforceability of the transactions with sovereign entities. The multi-faceted transaction included, among other elements, the sale of BHP Navajo Coal Company (BNCC), the owner and operator of the Navajo Mine, a large surface coal mining operation located on the Navajo Reservation in New Mexico, to NTEC. Represented the Oklahoma Department of Environmental Quality in its successful petition before the United States Court of Appeals for the District of Columbia Circuit to review a portion of an EPA regulation (the “Indian country NSR Rule”) arguing, among other grounds, that EPA was without statutory authority to displace state implementation plans with respect to non-reservation areas of States because EPA failed to make required jurisdictional determinations that such areas were within a tribe’s jurisdiction. The Court of Appeals set aside the rule with respect to the Oklahoma portions challenged. See Oklahoma Department of Environmental Quality v. Environmental Protection Agency, 740 F.3d 185 (D.C. Cir. 2014). Assist clients with permit management and transfers, including communicating with various federal and state regulatory authorities, arising from corporate mergers and acquisitions. Represent numerous clients in permitting projects triggering compliance with the National Environmental Policy Act (NEPA), National Historic Preservation Act (NHPA), Endangered Species Act (ESA), and related statutory and regulatory processes, including permitting and environmental compliance efforts regarding energy development on Indian lands.